Bottle Green Blazer with School crest, Plain Knit V-Neck Bottle Green Pullovers with School crest, White full sleeves Shirt, school Belt, Tie and Grey woollen socks. Steel Grey woollen trousers, Steel Grey woollen socks, Black school shoes with laces. Steel grey woollen trousers, Steel Grey woollen stockings, Black School shoes. 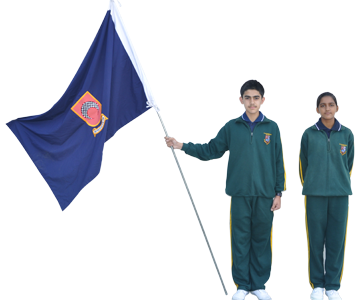 Royal Blue check coat with School crest, V-Neck Royal Blue Pullovers with School crest, White full sleeves Shirt, school Belt, Tie and royal blue woollen socks. White full sleeves shirt cotton or terycot, school belt, tie, Knee length grey socks. White full sleeves shirt cotton or terycot, school belt, tie, Royal Blue cotton socks. Royal Blue tunic with white full sleeves skirt. Royal Blue cycling shorts are compulsory for girls. Milky white full sleeves shirt with light grey blazer with school crest teamed with structured dark grey trouser.Grey pullover with blue border. Light grey sleeveless jacket (for girls during summer).Light & dark blue school tie, school belt and dark grey socks with black shoes. Punjabi Suit : Shirt - Green checked shirt an inch below the knee with cream Safari Collar with 3 checked buttons on it. Side slits a maximum of 15 inches. Full sleeves with half an inch cream border. Salwar - Cream loose salwar. Dupatta - Cream voil duppatta. Black school shoes with white socks. 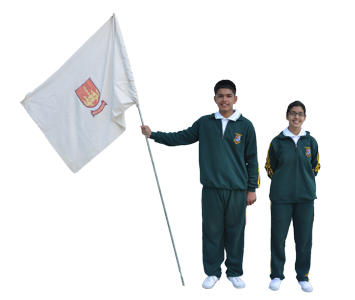 School Blazer with crest and plain V-neck pullover with school crest. Students with unkempt hair would be prevented from attending school. Must have simple short hair CREW cut. White patka for Sikhs. Applying hair gel is not permitted. Long to shoulder length hair must be braided into two plaits and tied with thin black ribbons. Class IX onwards girls are permitted to wear the hair in single braid. Girls with short hair must wear a black hair band or pin up the hair using black hairpins so that it does not fall on the fore head. The school advocates simplicity in daily life. Thus, wearing makeup, growing nails, applying mehandi or nail paint or wearing fancy jewellery and trinkets is not permitted. House T shirt, bottle green track suit, white tennis shoes and plain white socks (cotton or nylon). In summers Boys and Girls will wear Green T-Shirt with collar and school logo, bottle green track suits, white and green sports shoes and white socks for Physical Education. Wind cheaters and Jackets are not allowed in school. Shoes must be black leather. Boys are to wear shoes with laces. Slip on or fancy shoes are not allowed. The school belt and identity cards are an essential part of the school uniform.